If you suffer from Rosacea, you know how important it is to find the best type of skin care products for your skin. One important aspect of a good skin care routine is to use a good moisturizer; however, many moisturizers aren’t suitable for rosacea. How can you find the best face moisturizers for rosacea? This review will help you decide. First of all, it is important to know why you need to find a good moisturizer for rosacea. Many rosacea suffers experience sensitive skin that gets easily irritated. Therefore, it is important to find a moisturizer which doesn’t contain ingredients that could sting, burn, or irritate your skin even more. Moisturizers are also very important to use if you have rosacea because for skin to look good it has to be hydrated. The layer of moisture on your skin also helps to protect it from harmful irritants that can make rosacea even worse. This review examines the 3 best face moisturizers for rosacea and will help you decide which one is best for your skin type. Honeyskin Organics Ultimate Face and Body cream with aloe vera and manuka honey has been developed to provide moisture for even the most sensitive of skins. The many ingredients that are in Honeyskin Organics Ultimate moisturizer don’t just moisturize your skin, but also help to treat rosacea. It contains many scientifically well-researched natural ingredients to help heal skin. Aloe vera has proven antibacterial and antioxidant properties which can kill off most bacteria on the skin and help destroy free radicals. Also, manuka honey has medicinal properties which help to reduce inflammation and is also antibacterial. The Honeyskin Organics moisturizer also contains blue-green algae which help to repair the skin and provide it with essential nutrients. The Shea butter and cocoa butter also contain essential fatty acids which the skin needs to look healthy and beautiful. The Honeyskin Organics Ultimate Face and Body cream with aloe vera and Manuka honey has been developed to have a pH level of 5.5, making perfect for very sensitive skin. What are the main features of Honeyskin Organics Aloe Vera+Manuka Honey Ultimate Face and Body Cream? The combination of the many natural and organic ingredients makes this face and body cream an excellent moisturizer for rosacea. All of the natural ingredients are certified organic and have proven medicinal properties which are needed to kill off bacteria and reduce inflammation. There are many other benefits of Honeyskin Organics moisturizer. For example, it is fragrance-free, which makes it suitable also for men and people who have allergic reactions to fragrances. It is non-greasy, fragrance-free and doesn’t contain any cheap fillers. This is a quality product with natural ingredients which is why it is one of the best 3 moisturizers for rosacea currently on the market. The CeraVe Moisturizing Lotion has been developed to provide the skin with deep down moisturizing yet being gentle enough for rosacea. This moisturizer for rosacea has been developed using only a few ingredients, making it a good all-around moisturizer, reducing the chance that you could be allergic to one or more ingredient. 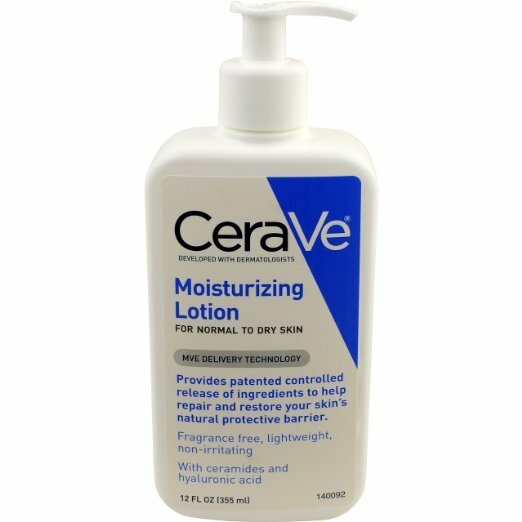 The moisturizing lotion by CeraVe has been developed with dermatologists to make sure that it can be used by people who suffer from rosacea and other forms of damaged skin. It is also noncomedogenic, meaning that it won’t clog up pores which can cause pimples and spots. CeraVe Moisturizing Lotion creates a moisture barrier on the skin and it light enough to penetrate the skin’s surface to moisturize the skin deep down. It also contains 3 ceramides, which are fatty acids to help moisturize and repair the skin. This helps to keep the skin looking healthy and protect it from irritants and pollutants. What are the main features of CeraVe Moisturizing Lotion? Even though CeraVe Moisturizing Lotion only contains 3 main ingredients, it does a great job of keeping the skin hydrated and looking great through the whole day. It is formulated to be gentle enough for people of all ages – from children under the age of 1 to people in their senior years. The fact that it has been formulated with dermatologists and has the stamp of approval from the Canadian Dermatology Association means that this is a great moisturizer for rosacea. 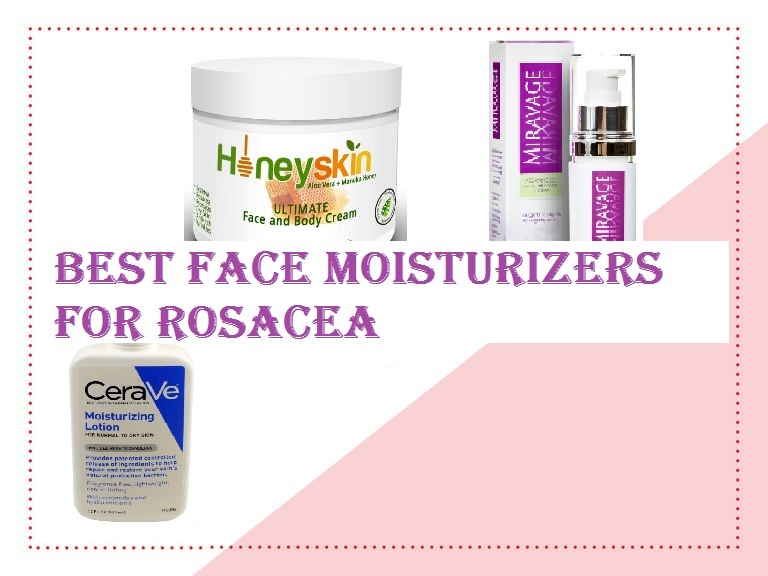 That is why we have ranked this among the top 3 of the best moisturizers for rosacea. Miravage Facial Redness and Rosacea Relief Cream has been specifically formulated to help reduce redness and skin irritation which is associated with rosacea. When you need to find an effective moisturizer for rosacea, you need one which will not just moisturize your skin but that will also help reduce irritation and inflammation. This is what Miravage Facial Redness and Rosacea Relief Cream does. The powerful active ingredients in Miravage Facial Cream can help to soothe all types of skin problems and also reduce the signs of aging. The facial cream from Miravage contains a unique patented formula designed by scientists to provide a complete skin care product in one bottle. In fact, the combination of ingredients contains all the properties for your skin that you would expect from a serum, redness reducer, lotion, and, of course, a great moisturizer. What are the main features of Miravage Facial Redness and Rosacea Relief Cream? Miravage Facial Redness and Rosacea Relief Cream has been designed to be more than just a great moisturizer for rosacea. It contains a unique formula to make sure that it very quickly and noticeably reduces redness. One of the benefits of Miravage Facial Redness and Rosacea Relief Cream is that it dries matte, so it helps reduce the appearance of greasy or oily skin. For best results, you should apply this rosacea relief cream twice a day. Because of its unique and effective formula, this is definitely one of the best 3 moisturizers for rosacea.